Welcome to Mermaid's Cove…a spacious beachside 3 bedroom / 3.5 bathroom private cottage available for vacation rentals that sleeps 12. This is the largest 3/3.5 floor plan at Pointe West, not the smaller 3/3. With unobstructed views of the ocean from the front balcony, you'll enjoy a relaxing vacation in our home. Our 3/3.5 beach house offers much more square footage than the 3/3 condos and the 3/3 cottages at PW and works great for large families. It offer the very large living/kitchen/dining gathering area for families. The house is designed with our bedrooms on the first level and the living, dining, kitchen and half bath on the second level which is open and spacious. The bedrooms are set up with a king in the master, queen in the second room, and a bunk bed and king convertible bed in the third room. We also have a new tempurapedic sleeper sofa in the living area. Each room has its own private bathroom. Close to the beach, Mermaid's Cove is an easy walk to the beach crosswalk and you can see the ocean from the front balcony. This makes it super convenient to come and go to the beach. Our home is located at Pointe West Resort, on the beautiful west end of Galveston Island. As a guest you have access to numerous Beach Club amenities including multiple swimming pools, a lazy river, Jacuzzis, BBQ grills, ping pong tables, gift shop, showers, weight and fitness room and adult's room with flat screen TV and Wi-Fi. This is a PRIVATE RESORT...all the amenities are available and included in your rental. From Beachfront cookouts to guided nature walks and supervised children’s programs, there’s always something new and intriguing to indulge in Pointe West. Galveston has many attractions including Schlitterbahn water Park, Moody Gardens Rain Forest, I Max and Aquarium. Whether you are seeking a memorable family vacation, a peaceful retreat, or a romantic getaway, you'll find the Mermaid's Cove just perfect for you! Only about a 90 minute drive from Houston Bush Intercontinental Airport (IAH), and a 56 minute drive from Hobby Airport, the Mermaid's Cove combines the magic of a remote getaway with the convenience of nearby attractions of downtown Galveston, Kemah, and Houston. Our home is ready to be enjoyed! Come make beach memories at the Mermaid's Cove! 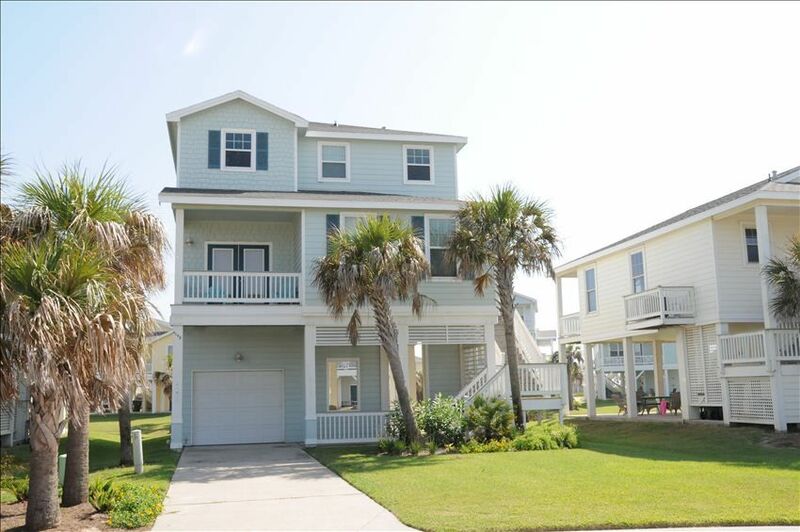 Keywords: beach house, cottage, 3 bedroom, 12, 8, Pointe West, Point West, 3/3.5 Beachside Cottage, nice views of beach, perfect for families, two balconies, comes with PW amenities of beach club, pools and lazy river. Great for our short getaway! Clean, spacious, and family friendly. We enjoyed our stay!!! Nice resort. The golf cart we hauled down came in handy to explore everything. Too bad we couldnt drive onto the beach. Great location, perfect for large family! We had a great visit! House was better than advertised. We had a great time. The home was clean and well kept. What a wonderful weekend! The house was so pretty, we loved the Mermaids everywhere:) The kitchen was fully stocked with everything we needed to cook large meals! There was plenty of room for all of us to sleep and the beds were so comfortable:) Everything was nice and clean and we will most definitely be back! Drive toward San Luis Pass! We have some of the nicest beaches in Galveston! Great location for a family vacation! Credit Cards are accepted via Paypal which adds a 3% processing fee. The renter must be 25 yrs old. Our home is non-smoking and no pets. We are currently not renting to prom or college groups. Pointe West has a resort fee per person as of Jan. 2015. You pay them directly at the beach club.